Happy 40th Crown Prince Frederik! 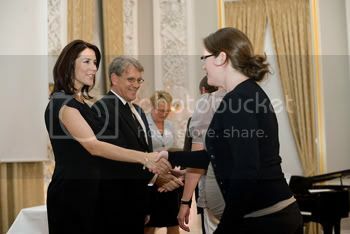 In the afternoon last Wednesday (June 4) Crown Princess Mary was in Moltke's Palace, Amalienborg, in Copenhagen to be present at the awarding of the Danish Cancer Society's Research Fund for 2008. 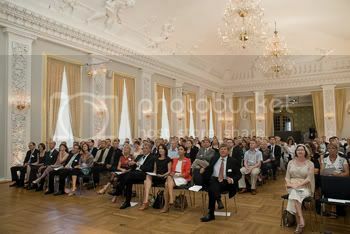 This is the first time the grants have been awarded in a ceremonial occasion, with Amalienborg drafted for the event. There are 66 recipients of grants across a wide area of disciplines within the field of cancer research to a total value of 74.7 million DKK. The Danish Cancer Society allocated money for research on Wednesday 4th of June. The society has distributed 74.7 million kroner to 66 research projects. H.R.H. 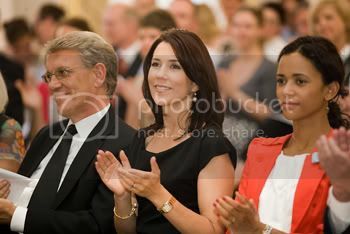 Crown Princess Mary participated in the presentations. The Cancer Society's Scientific Research Committee has had a large number of applications to process and consider - a total of 166 applications. The chairman of the Cancer Society's Scientific Research Committee, Professor Lars-Inge Larsson from the University of Copenhagen is in no doubt that the money distributed by the committee plays a very important part in supporting research in Denmark. "If we talk about epidemiological research into risk factors, for example, this has meaning for those who work in prevention, treatment and counselling, but often this has no direct meaning for the patients. For this kind of research the Danish Cancer Society is undoubtedly the largest contributor," he says. The Cancer Society's Scientific Research Committee has fifteen elected members both Danish and from abroad with wide professional experience. The money is being distributed over many institutions in different parts of the country. The committee's main assignment is to distribute money for research within the medical and scientific fields. Thanks Lotte for the reminder to us all that being royal is not just one long party. I thought just your description of some of their duties, combined with their parental responsiblities was quite daunting. It did balance my view of them as being hard working people who deserve a good party occassionally.